Buy your home today, but stagger your down payment for up to 90 days! 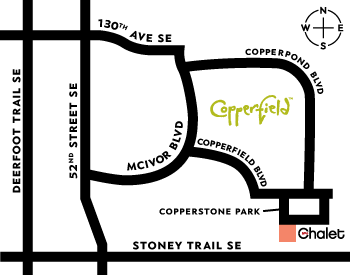 It’s all about finding ways to help you Live Happy with Hopewell at Copperfield Chalet. * Contact us for details! Our preferred mortgage partners will help you find the financial solutions that make home buying easy! We've got the best rates and down payment solutions you need. Get info now! Click to view our current promotions! We know we've got the exciting promos you'll love -- which you can add to our already-amazing prices, floorplans and features! It pays to be a parent -- refer your child to Chalet, and we'll thank you with $2,000! Choose to keep your referral, or contribute it towards your child's new home purchase. Get your referral! Have a home to sell? Use our preferred Realtor partner and we'll pay your listing fee -- which saves you thousands! Plus, enjoy special perks that help sell your home, fast. Contact us today! Your home is backed by the Alberta New Home Warranty Program for complete peace of mind and confidence in your investment. Plus, our dedicated Warranty team works with you after move-in. For over 20 years, Hopewell has set the benchmark for excellence in residential design and development. We're a Best Managed Company, and a two-time Multi-Family Builder of the Year! Building your new Hopewell home is an exciting and inspiring process, but it's also dependent upon sound financial decisions to ensure you're properly prepared. Use our mortgage calculator to find out!